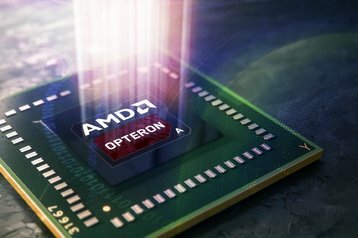 Silicon vendor AMD has finally launched its own 64-bit System-on-a-Chip (SoC) based on ARM architecture, the Opteron A1100. Codenamed ‘Seattle’, the new SoC is meant to present an alternative to Intel’s power-hungry range of Xeon and Atom processors that are dominating the data center market. The A1100 started shipping to developers and early adopters at the end of July 2015, and is now available in in mass production quantities. First servers based on the chip went on sale earlier today. “Customers now have access to 64-bit ARM processors from the only silicon provider that also has decades of experience delivering professional enterprise and embedded products,” said Scott Aylor, corporate vice president and general manager, Enterprise Solutions, AMD. Opteron A1100 was designed as a cheap (below $150) power-efficient SoC that fits multiple use cases. According to AMD, it could be used to build storage servers, web servers, IoT gateways and networking equipment for NFV. Primarily though, the A1100 is a development platform that’s meant to grow the ecosystem and pave the way for AMD’s upcoming efforts in the 64-bit ARM space. Each tiny (27x27mm) SoC features up to eight Cortex-A57 cores designed by ARM and clocked at up to 2GHz. It includes two integrated 10Gb Ethernet controllers, supports 8x PCIe, 14 SATA3 ports and up to 128GB of DDR3 or DDR4 memory. The expected lifecycle of the chip is 10 years. 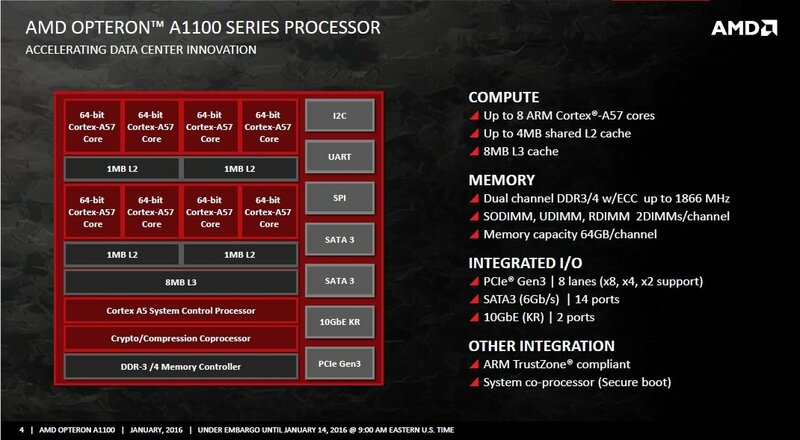 AMD’s hardware partners have already announced systems based on the A1100. For example SoftIron, a British software-defined storage startup that specializes in ARM silicon, has begun selling the Overdrive 3000 development system. Foxconn subsidiary Caswell has revealed plans to use the chip in NFV platforms, while the 96 Boards community, launched by Linaro last year, will work on low-cost server boards. Meanwhile Silver Lining Systems will develop high density compute and storage servers that feature A1100 and its SLS Fabric Interconnect, that the company claims lowers intra-rack networking costs by up to 75 percent. The technology was actually created by Calxeda, another startup that attempted to launch 64-bit servers based on ARM but folded in December 2013. The assets of the company were acquired by AtGames Digital Media, based in Taiwan, and later spun off as Silver Lining Systems. “Combining the efficient AMD Opteron A1100 processor with our unique fabric will help drive down costs and power requirements of hyperscale computing and storage,” said Dr. Ping-Kank Hsiung, managing director of SLS. AMD’s software partners for the launch include Suse and Red Hat – both have promised to get their Linux distributions and other software to take full advantage of the Opteron 1100. During the launch event Dan Bounds, senior director for data products at AMD, dismissed concerns that the new chip was competing in a small, crowded marketplace. 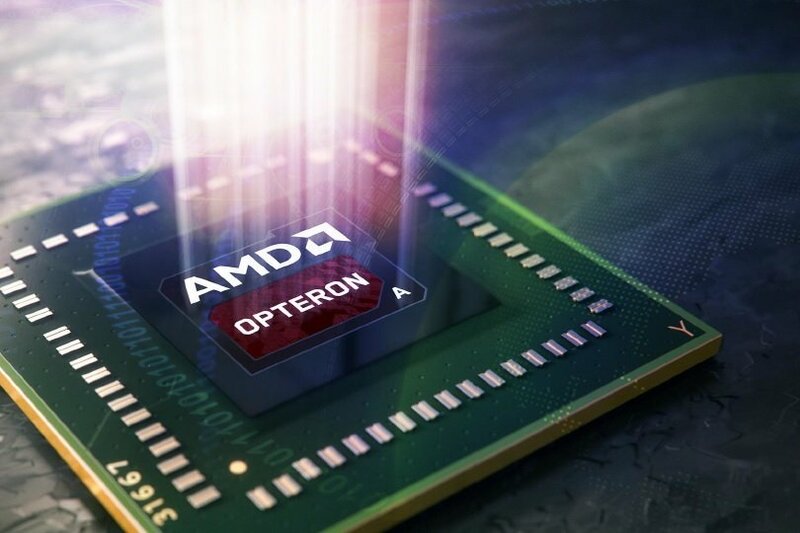 He said there was “no significant competition” in the ARM server space, and hinted that the “reference competitor” for the new Opteron was Intel, not Cavium or Applied Micro – two of the companies that have been most successful at marketing ARM for the data center.